In my monthly travels to visit my daughter and grandkids in the heartland of Indiana, I pass by Honeyville and know that it is mostly an Amish community. In time, getting to know the Amish and their old-world craftsmanship, and my life as a mill worker, I was able to see them make dreams come true in their skill to build any custom piece of furniture. 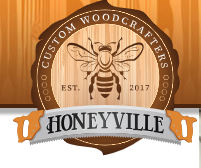 Working together now, we formed Honeyville Custom Woodcrafters, a place where you can order any custom piece of furniture, cabinet or any Amish made product. Visit our site often as we plan on adding many more products as time goes on. Our logo holds a special place in our hearts. We chose the honeybee as part of our logo in respect for how important their part in the Eco system is and to remind people that they need our help. To give back and help the honeybee population, we will also build custom hives at a discounted rate to do our part towards helping the honeybee.